The person coping with a loved one’s Alzheimer's Disease or another type of Dementia feels frustrated, sad, at times angry, lost and not in control. For those who feel this way, Caregiving for Caregivers is your compass and your map – educating and guiding you with meaningful information through Dr. Steinberg's Seminars and private sessions, as well as an Online Assessment questionnaire which can be filled out to receive valuable direct feedback from an expert in the field. Caregiving for Caregivers is a process developed by Roy Steinberg, Ph.D., whose education, training, and work as a geriatric psychologist has focused, for over a decade, on providing both Caregivers and their loved ones coping with the effects of aging, a path that will best serve them. There is a prevailing myth that aging is about illness and sadness. Our society, in many ways, supports this misconception. This is not, and need not, be the case. Though your loved one's Alzheimer's Disease or another type of Dementia can be a very real part of life, it does not need to define your life. Dr. Steinberg's expertise has helped thousands of people, from health care providers to Caregivers, understand that there is a better, healthier, more meaningful way. That way begins here. 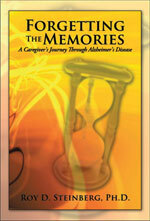 In a moving and easy to read format, Dr. Steinberg has laid out a true caregiver's guide to dealing with Alzheimer's disease, from the first signs to the final stages.